The Book of Mormon proclaims that in 34 C.E. the resurrected Jesus Christ descended from heaven to a place in the New World called Bountiful and delivered a sermon patterned after the Matthean Sermon on the Mount (3 Ne. 12:1-14:27; cf. Matt. 5:3-7:27). Jesus ended his sermon by telling those present that they had just “heard the things which I have taught before I ascended to my Father” (3 Ne. 15:1). Following a few other instructions, Jesus told the people to “write these sayings” down after he left (16:4). Evidently they carried out this instruction to make a written record of what Jesus taught them, because the next day the twelve Nephite disciples were able to preach to the people “those same words which Jesus had spoken—nothing varying from the words which Jesus had spoken” (19:8). Later this second day the Book of Mormon people were again told to write down what Jesus told them (23:4). Consequently, if the Nephites did as told, this sermon of Jesus was recorded on the Large Plates of Nephi (26:7) very soon after it was delivered. Mormon, the fourth century C.E. prophet-historian, utilized these same plates to transcribe a copy of the sermon onto the Plates of Mormon (see 26:11). Joseph Smith affirmed that he translated the “reformed Egyptian” text on these plates (Morm. 9:32) into the English language. Smith’s original dictation of this sermon to his scribe, Oliver [p.116] Cowdery, occurred during May 1829, and the first edition of the Book of Mormon was published in March 1830. Assuming that Matthew 5:3-7:27 and 3 Nephi 12:1-14:27 both record a single sermon delivered by Jesus on two separate occasions—once in the Old World, once in the New—and allowing for differences due to different audiences, it should be instructive to compare the two accounts in detail. Hugh Nibley, professor emeritus of history and religion at Brigham Young University, has suggested that one must test the Book of Mormon “against its purported background” in antiquity (1967, 166; 1988, 148). Such a comparison of the two sermons provides an ideal test of the Book of Mormon as a real translation of an ancient text. It is possible to identify places where errors, revisions, and additions have crept into the KJV. Published in 1611, the KJV relies on the Greek text of the New Testament available in the late sixteenth century. In the 381 years since then, hundreds of better and more ancient Greek, Latin, Syriac, and Coptic manuscripts have been discovered and brought us closer to the original Matthean text. This means that it is possible—given the opportunity of comparing the versions of Jesus’s Sermon on the Mount in Matthew and 3 Nephi—to make tentative judgments about whether the Book of Mormon stands up to the tests of historicity Roberts, Sperry, and Nibley proposed. If the Book of Mormon varies from both the KJV and the earliest texts, one cannot pronounce judgment on the Book of Mormon version, since the Book of Mormon variation could be specific to its audience and setting in the New World. However, if the Book of Mormon text departs from the errors of the KJV and agrees with the most original Matthean texts, it supports the claim that the Book of Mormon is a genuine translation of an ancient document. On the other hand, if the Book of Mormon text sides with the later Greek text as seen in the KJV, this dependence would be strong evidence against its historicity. The reason for this is that the Book of Mormon on the American continent should know nothing of changes and additions to the Sermon on the Mount made in the Old World centuries after the original sermon, but should be a direct link to the real words of Jesus. In this essay I will consider eight passages from Matthew about which a wide range of authorities agree that the KJV differs from the original text of the sermon and will then compare the Book of Mormon’s version of these same passages. These comparisons provide an important basis for conclusions about the historicity of the Book of Mormon, specifically whether it provides a more reliable version of Jesus’s sermon than the KJV. Establishing the “original” text of Matthew’s version of the sermon is a problematic process. All the New Testament documents were originally written in Greek, and since there is no evidence that anything was written down in Jesus’s Aramaic language, the best scholars can do is establish the most accurate Greek text of the Matthean Sermon on the Mount. The KJV relies on the Greek text which was available in the late sixteenth century. The first Greek text to be printed was completed in January 1514 as part of the Complutensian Polyglot under the direction of Cardinal Ximénez, but due to the delay in receiving approval from Pope Leo X it was not actually published until about 1522 (Ximénez 1514). The first published Greek New Testament, the Novum [p.118] Instrumentum omne, was printed in 1516. This was the product of Dutch humanist scholar Desiderius Erasmus. For the Sermon on the Mount, the printer set type directly from the twelfth-century minuscule 2 to which Erasmus added some corrections from a fifteenth-century minuscule and a few more corrections from the extremely valuable (but little used) text of the twelfth-century minuscule 1 (Erasmus 1516, 7-15). Erasmus issued subsequent editions in 1519, 1522, 1527, and 1535 with the traditional title Novurn Testamentum. This popular printed text crystallized for posterity that particular form of the Greek text found in the manuscripts Erasmus actually used. The sumptuously printed third edition of Robert Stephanus’s version in 1550 had the text of Erasmus along with the first critical apparatus of selected variant readings in the inner margin (Stephanus 1550, 6-12). Numerous folio and octavo editions were published by Theodore Beza from 1565 to 1604. The KJV, which was published in 1611, was primarily based on the 1572 second folio edition of the Bishops’ Bible, using Beza’s 1598 edition of the Greek text to make revisions. The printers Bonaventure and Abraham Elzevir published Greek New Testament editions in 1624 and 1633. It is this last edition which first employed the term Textus Receptus or “Received Text,” pointing to its reliance on the generally accepted New Testament text in the previous editions (Finegan 1974, 8). Since the text for the Sermon on the Mount is precisely the same for Stephanus 1550 and Elzevir 1633, one can use the term Textus Receptus to refer to either. This name may lead to a belief in the text’s unquestionable authority, but the Textus Receptus is only entitled to our respect insofar as it can be shown to conform with the best manuscripts. Only a few manuscripts, all of late origin, provide the basis of the printed Textus Receptus, but today many more manuscripts are available—hundreds of cursive manuscripts or minuscules going back to as early as the ninth century, more than thirty uncial or capital letter manuscripts from the fourth to the tenth centuries, and a papyrus of C.E. 200. One must not assume that a minuscule (which is generally of later date than an uncial) is necessarily of less value or always later than an uncial, for some ninth- to twelfth-century minuscules have a better text than many eighth- to tenth-century uncials. The editors of these Greek editions reached their decisions by following different lines of evidence based on their own assessment of what were the most significant factors in each case. They represent a diverse range of critical positions. There is Constantinus Tischendorf’s preference for his important discovery (Codex Sinaiticus of the fourth century) and B. F. Westcott and F. J. A. Hort’s preference for the oldest uncial (Codex Vaticanus also of the fourth century) to counterbalance Hermann von Soden’s preference for the Byzantine type whenever it is supported by one of his two other main recensions. There is the range from the committee decisions behind the Nestle-Aland twenty-sixth edition, the British and Foreign Bible Society edition, and R. V. G. Tasker’s Greek edition of the New English Bible on the one hand, to the individual Roman Catholic scholarship of Augustinus Merk, José Bover, and José O’Callaghan and the stylistic eclecticism of G. D. Kilpatrick on the other. Given this wide spectrum of scholarly judgment, it is a marvel that there are any significant passages in the Sermon on the Mount for which all of these authorities agree against the Textus Receptus. To be included among the passages I am using in this essay, all ten editions must print the reading (without brackets) in the main body of the text. In others words I rely not on majority agreement—which [p.120] among such diverse scholarly opinion would be significant—but on unanimous agreement. To further reduce the number of available examples and to provide even stronger restrictions on possible choices, the reading agreed on by these editions must also have support from the earliest and best Greek manuscripts, from each of the three earliest translations, and from a pre-Nicean patristic writer. What this means is that each variant selected not only must be printed in the above ten works but also must receive support from the C.E. 200 papyrus 64 (where extant), from at least the two oldest uncial codices of the fourth century, and from at least the most reliable group of minuscules—family 1 of the tenth to fourteenth centuries (Lake 1902); from the Latin with at least some Old Latin support, from the Syriac, and from the Coptic; and from a patristic writer of the second or third centuries (whenever there is a patristic quotation prior to the fourth century for that specific verse). Applying these restrictions leaves only eight passages. The evidence on which I based my conclusions about these passages is provided in the Technical Appendix to this essay. In each of the following eight passages, evidence argues strongly against the Textus Receptus and favors the modern critical Greek text. The internal and external evidence discussed in the appendix demonstrates that all eight textual variants are later additions or revisions to the text. For the convenience of readers, an English rendition of the critical Greek text as well as the Textus Receptus is presented for each passage under consideration. For the critical text, the 1989 edition of the New Revised Standard Version (NRSV) has been used, although almost any modern English version of the New Testament could have been used since it would be based on one of the twentieth-century Greek editions. For the Textus Receptus, the wording of the 1828 Phinney edition of the KJV (rather than the text of the original 1611 edition) has been followed, since it provides an early nineteenth-century American printing of that version. The 1830 edition of the Book of Mormon will be juxtaposed at these crucial junctures.3 The dictated [p.121] Original Manuscript (O) for the Book of Mormon is not extant for these chapters. However, the Printer’s Manuscript (P) exists, and an examination of each of the examples shows no significant textual variation between the manuscript and the 1830 publication. And if your right hand causes you to sin, cut it off and throw it away; it is better for you to lose one of your members than for your whole body to go into hell. And if thy right hand offend thee, cut it off, and cast it from thee: for it is profitable for thee that one of thy members should perish, and not that thy whole body should be cast into hell. Behold, I give unto you a commandment, that ye suffer none of these things to enter into your heart: for it is, better that ye should deny yourselves of these things, wherein ye will take up your cross, than that ye should be cast into hell. Clearly the Book of Mormon revises this passage, but it retains that part of the KJV which has been questioned by modern scholarship. That the Book of Mormon replaces the corresponding Matthean passage is shown by the fact that the verses immediately before and after this section in the Book of Mormon correspond to the verses in the KJV before and after Matthew 5:29-30. In this Book of Mormon replacement, the Lord commands the Nephites not to allow into their hearts any thoughts of lust, because he says (in wording reminiscent of Matthew 16:24) that it is better to deny themselves of these things and take up their cross than that they “should be cast into hell” (3 Ne. 12:30). Because of these last five words, the Book of Mormon version is not a complete replacement of the corresponding Matthean verses. The Book of Mormon retains the suspect KJV words,5 but the earliest New Testament texts have the variant reading “go into hell.” The evidence, then, [p.123] suggests that the Book of Mormon follows the KJV in having the later, secondary text. For with the judgment you make you will be judged, and the measure you give will be the measure you get. For with what judgment ye judge, ye shall be judged: and with what measure ye mete, it shall be measured to you again. For with what judgement ye judge, ye shall be judged: and with what measure ye mete, it shall be measured to you again. The Book of Mormon in 3 Nephi 14:2 follows the later form of the text which is found in the KJV. The “again” at the end of the verse is due to an assimilation to the parallel in Luke 6:38. Welch downplays the difference among the variants in Matthew 7:2 by saying that the difference is “negligible,” but it is often such fine distinctions that are clues in textual criticism and such variants can be detected in translation (Welch 1990, 155). For example, it can usually (but not always) be shown what Greek text the Latin, Syriac, and Coptic versions were based upon. Similarly the English KJV can be shown (though there has never been any controversy about it) to have been based on the later Greek Textus Receptus antimetrethesetai (“it will be measured … in return”). Again the Book of Mormon includes the later material found in the KJV. Welch concedes that the earliest manuscripts support the shorter text of Matthew 5:44 and that later Matthean texts incorporated [p.124] additional words from the synoptic parallel in Luke 6:27-28, but he justifies the Book of Mormon inclusion of this later material because it is found in Luke 6:27-28, and accordingly “it is possible to believe that he [Jesus] said the longer saying in Bountiful” (Welch 1985, 12). In another study Welch asserted that it is possible either the shorter text was on the golden plates and Joseph Smith expanded it during the translation process to the full text of Luke 6:27-28 (ignoring the fact that the Book of Mormon text is the same as the KJV in Matt. 5:44) or the full text of Luke 6:27-28 was on the plates as part of the Matthean sermon and translated correctly by Joseph Smith (Welch 1990, 156). Certainly it is possible to believe almost anything, but the probability is that the material in the extra clauses represents Lucan redaction and that the simpler text in the earliest form of Matthew is original. This verse is such a complex combination of Lucan phrases added to the Matthean original, it is unlikely that anyone could have guessed the shorter, original text of Matthew 5:44 before the more ancient manuscripts were found. Mapping out the variants displays the development and derivation of this text in the New Testament manuscript tradition (see the Technical Appendix for these variants). In 3 Nephi 12:44 the Book of Mormon again aligns itself with the later text (Matthew 5:44 in the KJV) and has neither the original nor any of the ancient variants. Welch acknowledges that there are “those who might see this point here to be more of a problem for the Book of Mormon” than the other examples (1990, 156). so that your alms may be done in secret; and your Father who sees in secret will reward you. That thine alms may be in secret: and thy Father, which seeth in secret, himself shall reward thee openly. that thine alms may be in secret: and thy Father which seeth in secret, himself shall reward thee openly. so that your fasting may be seen not by others but by your Father who is in secret; and your Father who sees in secret will reward you. That thou appear not unto men to fast, but unto thy Father which is in secret: and thy Father, which seeth in secret, shall reward thee openly. that thou appear not unto men, to fast, but unto thy Father, which is in secret: and thy Father, which seeth in secret, shall reward thee openly. At the end of these three verses, the Book of Mormon follows the later text of the KJV, with its addition of “openly.” In an effort to justify the existence of “openly” in the Book of Mormon, Welch asserts that this “conveys the only possible meaning of these verses,” which is that “God will openly reward the righteous with treasures in heaven on the judgment day” (1990, 156). Others interpret these verses quite differently, for their simple message seems to be that God’s reward “may be no more ostentatious than the secret deed” (Clark 1980, 151), the inner feeling of peace from having done the right thing. God’s promise is that proper recompense will come—without specifying how or when. And do not bring us to the time of trial, but rescue us from the evil one. And lead us not into temptation, but deliver us from evil: for thine is the kingdom, and the power, and glory, for ever. Amen. And lead us not into temptation, but deliver us from evil. For thine is the kingdom, and the power, and the glory, for ever. Amen. Both the Book of Mormon and the KJV share the later addition. The significance of this example is enhanced by the popularity of the Lord’s Prayer. In the New Testament manuscript tradition, there are thirteen known variant forms of the doxology (i.e, “For thine is the kingdom, and the power, and the glory, for ever. Amen.”). The earliest sources contain no doxology, and twelve variants range from the simple, one-word amen to Chrysostom’s intricate trinitarian formula, though the majority of manuscripts have the traditional three-part doxology.6 The [p.126] Book of Mormon in 3 Nephi 13:13 follows the late, traditional doxology, and has no revised wording to coincide with one of the early variant forms (see the Technical Appendix in Example 8). The evidence derived from datable documents clearly shows in Matthew 6:13 the growth and development of theological ideas. Hugh Nibley has claimed that the oldest Greek manuscripts contained the doxology, but when pressed concerning this assertion, he retreated, saying that the doxology “should have been” in the earliest Matthean manuscripts (1990, 47-48). Welch acknowledges that the earliest New Testament manuscripts lack the doxology but argues in a circular manner that the fuller text of the Lord’s Prayer in Matthew is the original and is to be preferred over the Lucan form, since the former is the one found in the Book of Mormon (1976, 16-17; cf. McConkie 1965, 237). 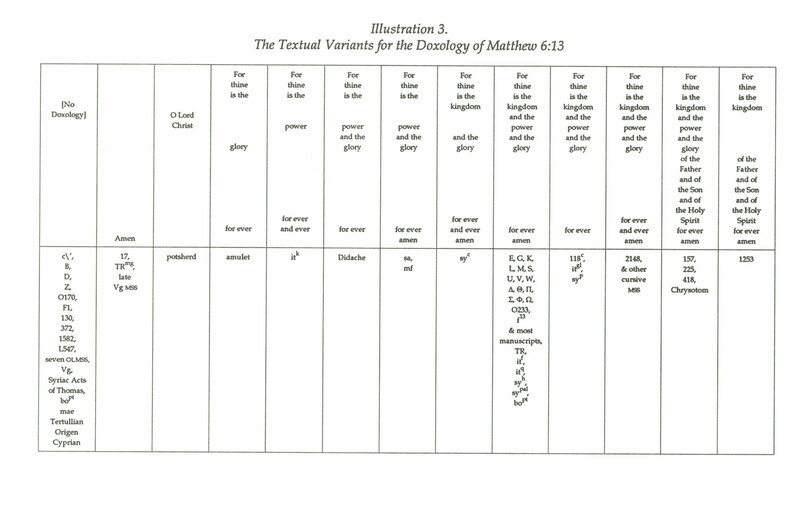 The problem with the doxology is not only that the earliest manuscript evidence lacks any such form but also that the fixed form of the doxology probably did not develop, as Welch says, “until 50 or so years after the Gospel of Matthew was written” (Welch 1985, 14). The Book of Mormon sermon in 3 Nephi 12-14 is said to have been delivered in 34 C.E. Nibley, in an attempt to justify the Book of Mormon’s inclusion of the doxology, makes several assertions concerning the Lord’s Prayer: “The older Aramaic form of the prayer required forgive ‘our debts’ which the Greek of Luke changes to forgive ‘our sins.’ This vindicates … the reading there [3 Ne. 13:11] of ‘debts’ instead of ‘sins'” (1978, 51, emphasis in original; 1987, 56). What Nibley does not mention is that the Matthean form is “our debts” and the Book of Mormon simply follows the words of the English KJV for Matthew 6:12. In fact, the evidence Nibley quotes, from Joachim Jeremias, goes against the Book of Mormon, affirming a gradual development of the doxology. The chronology of the Book of Mormon requires a fullblown doxology in 34 C.E. Although Welch tries at each point to demonstrate the possibility, plausibility, or even probability of the Book of Mormon version, his argument remains unconvincing. Welch does not acknowledge that in [p.127] each of the instances where there is abundant textual variation, not only in Greek manuscripts but also in Latin, Syriac, Coptic, and patristic texts, the Book of Mormon never follows either what is almost unanimously considered to be the original text or any of the early developments from the original text in the Old World. Instead the Book of Mormon always follows the secondary text seen in the late Textus Receptus, codified in the English language in the KJV of 1611. Because the Book of Mormon version of the Sermon on the Mount agrees with the KJV rather than the earliest Greek text on these eight points, its dependence on the KJV is apparent. Wherever the Book of Mormon has revised or added to the KJV text, the variant in the Book of Mormon does not relate to the ancient variants known in the manuscripts. Not only do the distinctive Book of Mormon additions and revisions to the KJV never receive ancient support, but also the important Book of Mormon omissions—except one—do not receive such support (Legg 1940). Only the following Book of Mormon omission seems to receive ancient support. But I say to you that if you are angry with a brother or sister, you will be liable to judgment; But I say unto you, That whosoever is angry with his brother without a cause shall be in danger of the judgment: But I say unto you, that whosoever is angry with his brother, shall be in danger of his judgement. The absence or presence of eike in Matthew 5:22 is a genuinely ambiguous case, with significant evidence on both sides of the question. Welch has already given the evidence for its omission. Its presence is supported by the remainder of the uncials and minuscules, most of the Old Latin manuscripts (including the important Codex Bobiensis), three manuscripts of the Vulgate, all the Syriac versions (including the important Sinaitic Syriac), both the Sahidic and the Bohairic versions, Irenaeus, part of Origen, and Cyprian (Black 1988, 5-6). Also, the presence of homoeoarchton, which is an accidental error caused by the eye skipping from the beginning of one word to the same beginning in another word, favors the original presence of eike. The skip would have been from the epsilon at the beginning of eike to the epsilon at the beginning of the next word, that is, from eike to enochos. Due to this uncertainty, a decision concerning the reading remains tentative. Accordingly, Merk shows due caution in bracketing eike because there is not a clear-cut case concerning “without a cause” at Matthew 5:22. In view of the equivocal nature of the textual evidence, the editors of the United Bible Societies’ Greek New Testament in their four-level system of grading the relative degree of certainty concerning the originality of a reading ranked the absence of eike as a C-rating. Consequently, though the case is not clear-cut and there is evidence that it may be an accidental omission in the Greek, on balance I would lean to the opinion that eike “without a cause” was not originally in Matthew 5:22. The absence of eike was known before 1830 when the Book of Mormon appeared, since it was discussed by Desiderius Erasmus, John Mill, Johann Wettstein, Johann Gilesbach, and Andreas Birch in reference to the Greek text, not translated in William Tyndale’s New Testament from 1526 to 1535, and popularized by various English writers. For example, the Methodist writer, Adam Clarke, whose multi-volume biblical commentary was first published in London in 1810 with at least ten American printings and editions in New York from 1811 to 1829, suggested that it was a marginal gloss which later entered into the text (Clarke 1825). It is interesting that Clarke favors the omission of eike at Matthew 5:22 and the retention of the doxology in Matthew 6:13 and that the Book of Mormon follows Clarke’s decision in these two passages. However, not too much significance [p.129] should be attached to this agreement since Clarke appears to favor the omission of tois archaiois in Matthew 5:27 and the omission of en to phanero in Matthew 6:18, and the Book of Mormon does not have these omissions. However, the Book of Mormon omission of “without a cause” need not depend on any of these sources, since the phrase could have been deleted simply because it detracted from the strength of Jesus’s command against anger. It has been suggested that the ancient support which this Book of Mormon deletion received could be due to “a coincidence caused by a problem with the wording of the KJV” (Barney 1986, 89). Since there could be coincidental agreement, the same omission in two separate texts is not significant in establishing a connection between them. What is important in textual criticism is the same distinctive addition, peculiar error, or the same alternate reading. It is significant to note that among the thirty-eight known variants and sub-variants of these eight secure examples, the Book of Mormon always aligns itself with the derivative text found in the Textus Receptus which was printed by Stephanus in 1550 and never agrees with either the original text or any of the other known variant readings. If the Book of Mormon were a genuinely ancient text, it would not always be expected to side with what modern scholarship concludes is the original text, but certainly there ought to be some agreement. Just as a careful comparison of Gabriel Sionita’s 1633 Harclean Syriac Apocalypse discloses his conjectural emendations, which were based on late Erasmian Greek and Clementine Vulgate texts, so an exhaustive examination reveals that this Book of Mormon sermon depends on the 1550 Textus Receptus, as relied on by the English text of the KJV. Though many Latter-day Saint scholars now admit that the KJV was used in the production of the Book of Mormon, there are still a few who prefer the position that Joseph Smith did not use the KJV or that God chose to quote from the KJV (Petersen 1979, 52-56; Welch 1990, 131-36; Skousen 1990, 55). The issue then becomes to what extent does a direct connection exist between the Book of Mormon and the KJV. Precise parallelism challenges the claim that the Book of Mormon is an independent translation of the biblical passages. These considerations prompt one to date the origin of the Book of Mormon account of Jesus’s sermon after 1769 and before 1830 when the Book of Mormon was published. This analysis based on textual criticism confirms that of Krister Stendahl, former dean of the Harvard divinity school, that the Book of Mormon text of the sermon is not a genuine translation from an ancient language but Smith’s nineteenth-century targumic expansion of the English KJV. Among other things Stendahl discussed the implications of the Book of Mormon extension of a miracle from a single person to a multitude in 2 Nephi 11:14-15, the “targumizing” expansion in 3 Nephi 12:23-24, and the “rationalizing” expansion in 3 Nephi 12:26 (Stendahl 1978, 141, 144-45; 1984, 101, 103-104). Stendahl indicated that apocryphal documents have such clarifying expansions and rational explanations and concluded that “it seems very clear that the Book of Mormon belongs to and shows many of the typical signs of the Targums and the pseudepigraphic recasting of biblical material” (Stendahl 1978, 152; 1984, 111). The presence of relatively late Johannine elements in the Book of Mormon account in 3 Nephi also is telling evidence of its own dependence on the KJV. An argument could be made that Joseph Smith decided simply to copy from the KJV, to which he had immediate access, those verses which paralleled material on the plates. But so much of the Book of Mormon is composed of biblical and biblical-sounding passages, including some which post-date the exodus of Book of Mormon people from the Near East, that one wonders how much the Book of Mormon’s value as corroboration for the Bible is diluted by its dependence on the KJV. In terms of attempting to pinpoint the origin of the Book of Mormon, even more significant than Book of Mormon revisions are places where it follows the KJV into error, echoing mistranslations or including translations of late and derivative Greek texts. Certainly the Book of Mormon should not have the same errors which displaced the original and crept into the text over the centuries. Since to plagiarize means to [p.132] appropriate and use, without acknowledgment, the words of another, one must here use the term—as harsh as it may sound—to characterize Smith’s dependence on the KJV. The Book of Mormon account of Jesus’s sermon in 3 Nephi 12-14 originated in the nineteenth century, derived from unacknowledged plagiarism of the KJV. Smith copied the KJV blindly, not showing awareness of translation problems and errors in the KJV. Yet the Book of Mormon is not a slavish copy of the KJV—there are numerous words deleted, revised, or added to the text. Rather than translate from an ancient document, Smith seems to have quoted from Matthew 5-7 of the KJV and to have made certain revisions as a response to the English text of the KJV. The Book of Mormon cannot be exempted from such textual criticism by emphasizing that translation inevitably introduces elements from the translator’s environment. The Book of Mormon describes a process of transmission which is not that far removed from certain other texts. The Book of Mormon claims to be an English translation from a text on gold plates inscribed by Mormon using “reformed Egyptian” (Morm. 9:32) in the fourth century but derived directly from contemporary records written in the Nephite language in 34 C.E. The transmission of the New Testament manuscript known as the Sinaitic Syriac parallels that of the Book of Mormon—at least for the first two stages. The Sinaitic Syriac, which was discovered in the late nineteenth century, is a palimpsest or manuscript in which the original writing has been scraped off and other writing placed on top. This fourth-century Syriac manuscript contains a late second-century translation from the original Greek of the New Testament, which in turn is assumed to be a translation of the Aramaic words of Jesus. The manuscript was translated into English in the late nineteenth century. Naturally the underwriting of the Sinaitic Syriac has certain identifiable scribal errors and unique readings, which may or may not represent the original text. 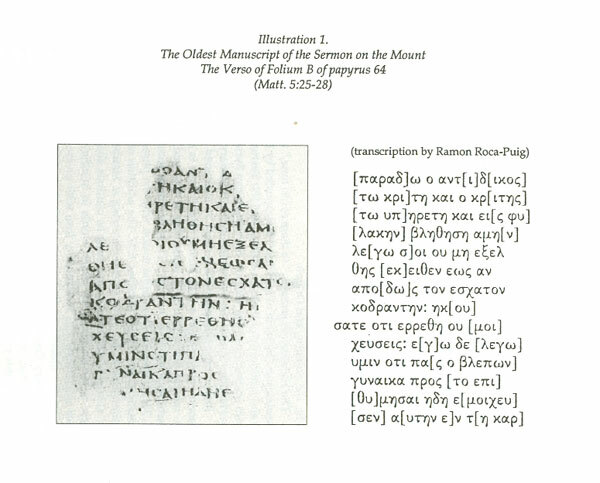 Still the English translation can be shown to represent a very early stratum of the developing text of the Sermon on the Mount, almost always supporting the earliest known Greek texts and not the Textus Receptus (Lewis 1910). If it translates an ancient text, the Book of Mormon similarly should fit into its historical context, even if one views it through an English translation. There is general agreement that the climax of the Book of Mormon narrative is the dramatic account of the visit of the resurrected Jesus to the Nephite people and his teachings to them. Unfortunately, at the juncture where the Book of Mormon could offer a fresh translation directly from the valuable fourth-century inscription of a first-century document, one finds a reaction to the late and corrupted text of the KJV. A variety of examples has shown that the Book of Mormon text follows errors of the KJV, but no clear evidence shows the [p.133] Book of Mormon restoring the long-lost original. The various discoveries of biblical manuscripts in the last four hundred years have provided an increasingly better understanding of specific passages in the Sermon on the Mount. In each of the passages we have examined, the earlier and better manuscripts of the gospel of Matthew take us back to the earliest ascertainable form of the sermon, but the Book of Mormon never takes us to a verifiable text in antiquity. According to Hugh Nibley, “We can never prove absolutely that the Book of Mormon is what it claims to be; but any serious proven fault in the work would at once condemn it. If I assume the Book of Mormon to be fraudulent, then whatever is correct in it is merely a lucky coincidence, devoid of any real significance. But if I assume that it is true, then any suspicious passage is highly significant and casts suspicion on the whole thing, no matter how much of it is right” (1953, 831; all but the first clause has been deleted in Nibley 1989, 56). We need not agree that Book of Mormon dependence on errors in the KJV Sermon on the Mount “casts suspicion on the whole” text of the Book of Mormon. My conclusions are confined to 3 Nephi 12-14. On purely text-critical grounds, the historicity of 3 Nephi 12-14 is suspect. Nowhere in the Book of Mormon version of Jesus’s sermon is there any indisputable evidence of its being a translation from an ancient document (Ashment 1980). One can never prove that something did not happen. All that can be said is that there is no evidence to substantiate the view that the Book of Mormon records a real visit by the resurrected Jesus to the place called Bountiful in the Book of Mormon. I will examine each of the eight passages from the Sermon on the Mount in some detail, presenting English translations of the two major forms and summarizing the external evidence supporting both the modern critical Greek text and the Textus Receptus. Also whenever the margin of the edition of Stephanus has a variant reading, this information is cited in order to indicate what variants were already known by the middle of the sixteenth century (Stephanus 1550). It is important to see the strength and array of the documentary evidence on both sides of each textual question in order to evaluate rival readings and decide which among them is the original from which the others sprang. The external evidence will be cited in the following order: the Greek manuscripts (the papyrus, the uncials, and then the minuscules), the text and margin of the 1550 Textus Receptus, the Latin, Syriac, and Coptic witnesses, and last the early patristic writers. The examples have been grouped into three categories: passages that show either influence from [p.134] the immediate context (Examples 1-2) or influence from the Lucan parallel (Examples 3-4) or a textual addition (Examples 5-8). The modern critical text found in examples 1, 3, and 5 (third instance) is preferred because it is based on more reliable and better quality manuscripts, not because it happens to be supported by the majority of Greek manuscripts (Hodges and Farstad 1982). Counting the number of manuscripts in support of a particular reading is not nearly as significant as weighing their intrinsic value (Metzger 1968, 158). Because some texts received ecclesiastical authorization, they were copied into manuscripts more frequently than earlier, more reliable texts. The readings of the modern critical text in the other examples are supported by considerably fewer manuscripts, but these manuscripts are demonstrably older and of better quality. Careful evaluation of the evidence means considering the date of the manuscripts, their geographical distribution, and their genealogical relationships (Metzger 1968, 209). In each instance the possibility of either intentional alteration or unintentional corruption must be considered. Most often losses were due to unintentional errors of the eye, ear, and/or hand, while additions to the text were due to scribal alteration. One of the most important principles of textual criticism, especially applicable to intentional changes, is difficilior lectio potior: the harder reading is to be preferred (Taylor 1961, 4). The difficulty of the original reading leads to revised readings, which were made by scribes to solve or clarify the problem. An independent investigation of unintentional alterations made during an oral recitation of the Book of Mormon found that errors occurred due to misreadings caused by similar appearance of words, by immediate context, and by adding or deleting letters or words (Larson 1977, 27-28). A variety of diversified and early external support and differing transcriptional and intrinsic internal considerations have led to strong preference for the modern critical Greek text over the sixteenth-century Textus Receptus. Examples 1 and 2 illustrate how change occurs due to influence from the immediate context. The only New Testament papyrus covering one of the eight [p.135] selected passages in the Sermon on the Mount is the very early papyrus 64, which is dated circa 200 C.E. (see Illustration 1). This papyrus, composed of fragments located in Oxford and Barcelona, contains verses for the 3rd, 5th, and 26th chapters of Matthew. The three Oxford fragments are numbered papyrus 64, while the two Barcelona fragments were given the number papyrus 67 (C. Roberts 1953, 233-37; Roca-Puig 1956). In 1962 Colin H. Roberts identified these separated fragments as part of the same papyrus (Roca-Puig 1962, 63-64; Elliott 1989, 21-22). This valuable papyrus takes one back in a single step 950 years earlier than Erasmus’s oldest manuscripts and enables us to examine a passage from the Sermon on the Mount in a document copied only a little over one century after the autograph. In Matthew 5:27 the words “you have heard that it was said, you shall not commit adultery” (NRSV), which are legible on one of the fragments of papyrus 64, confirm the shorter text of the fourth-century Codex Sinaiticus, the fourth-century Codex Vaticanus, the fifth-century Codex Bezae Cantabrigiensis, ten other uncials, family 1 and enough other minuscules to form a majority of the Greek manuscripts, the margin of the 1550 Textus Receptus, five Old Latin manuscripts, the fourth-century Sinaitic Syriac, the Peshitta, the Harclean Syriac asterisks (which indicate an awareness of the text without the addition), the Sahidic, the Bohairic, and Origen. The addition tois archaiois, “to them of old time,” which the KJV mistranslates as “by them of old time,” is supported by five uncials, family 13 and a minority of the minuscules, the 1550 Textus Receptus, six Old Latin manuscripts, the Vulgate, the Curetonian Syriac, the basic text of the Harclean Syriac, the Palestinian Syriac lectionary, and Irenaeus. And if your right hand causes you to sin, cut it off and throw it away; it is better for you to lose one of your members than for your whole body to go into hell. And if thy right hand offend thee, cut it off, and cast it from thee: for it is profitable for thee that one of thy members should perish, and not that thy whole body should be cast into hell. In Matthew 5:30 the reading eis geennan apelthe, “go into hell,” is supported by the fourth-century Codex Sinaiticus, the fourth-century Codex Vaticanus, family 1, 22, 33, 157, the original hand of 660, 892, and the margin of the 1550 Textus Receptus. A subvariant of this reading with a different order of words, apelthe eis geennan, is supported by the fifth-century Codex Bezae Cantabrigiensis, 372, 517, and 1675. Kurt Aland and Barbara Aland cite Codex Bezae as both having the reading “go into hell” near the end of Matthew 5:29 and omitting the whole of Matthew 5:30, but this is not an accurate representation of its text (Aland and Aland 1979, 11; cf. Scrivener 1864, 12). There is indeed a skipping of material in both the Greek and the Latin columns of Codex Bezae, but the omission is much more likely to have been due to homoeoteleuton from any of the nineteen consecutive words in v. 29 which are exactly duplicated in v. 30; that is, the omission (working equally well in the Greek or the Latin) could be from a point in v. 29 to the corresponding point in v. 30, rather than being an omission of all of v. 30. This would explain the reading “go into hell,” which is not found in the original hand of any Greek manuscript for v. 29 but is found elsewhere in Greek at v. 30 and corresponds with the Latin order eat in gehennam. 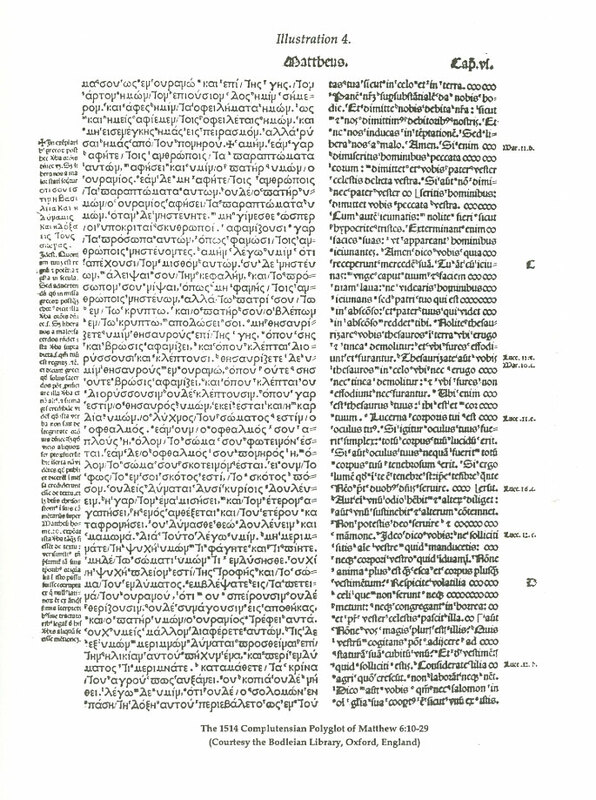 Most of the Old Latin, the Vulgate, the fourth-century Sinaitic Syriac, the fifth-century Curetonian Syriac, the Palestinian Syriac lectionary, the Bohairic, and the Middle Egyptian match the text with the variant order, but due to the looseness of word order in translation or the grammatical preference for the position of a prepositional phrase, these versions may just as likely be derived from a Greek text with the word order of Codex Sinaiticus and Codex Vaticanus. The variant reading in Matthew 5:30 blethe eis geennan, “be cast into hell,” is a scribal assimilation to the reading at the end of Matthew 5:29, which talks about the right eye causing a person to sin and ends with the statement that it would be better for a person to lose his eye than that his entire body “should be cast into hell.” It is supported by sixteen uncials, family 13 and the majority of minuscules, the 1550 Textus Receptus, four Old Latin manuscripts, one manuscript of the Vulgate, the Peshitta, the Harclean Syriac, and the Sahidic. There are three [p.138] sub-variants derived from this variant reading: “to be cast into hell,” which is an assimilation to the infinitive in either Matthew 18:9 or Mark 9:47, is the reading of a thirteenth-century minuscule; “you shall be cast into hell” is the reading of the eighth-century Codex Regius; and “into hell be cast,” which may be an assimilation to the wording of Luke 12:5, is the reading of a twelfth-century minuscule. The textual interrelationships among the synoptic gospels (Mark, Matthew, and Luke) also help determine the original Matthean reading. One must also consider the problem of the production of the Sermon on the Mount by the author of Matthew and its relation to the Sermon on the Plain by Luke and scattered verses elsewhere in Luke and Mark. Scholars of the synoptic problem generally conclude that it is unlikely that the basic form of the Sermon on the Mount was ever delivered by the historical Jesus. While this is not the place to review the synoptic problem, one of the secure results of scholarly study is the priority of Mark over Matthew and Luke, to which almost no New Testament scholar would take exception (Tuckett 1983; Kee 1989; cf. Farmer 1976). If any of you put a stumbling block before one of these little ones who believe in me, it would be better for you if a great millstone were hung around your neck and you were thrown into the sea. If any of you put a stumbling block before one of these little ones who believe in me it would be better for you if a great millstone were fastened around your neck and you were drowned in the depth of the sea. And if your foot causes you to stumble, cut it off; it is better for you to enter life lame than to have two feet and to be thrown into hell. If your right eye causes you to sin, tear it out and throw it away; it is better for you to lose one of your members than for your whole body to be thrown into hell. And if your eye causes you to stumble, tear it out; it is better for you to enter the kingdom of God with one eye than to have two eyes and to be thrown into hell, And if your eye causes you to stumble, tear it out and throw it away; it is better for you to enter life with one eye than to have two eyes and to be thrown into the hell of fire. where their worm never dies, and the fire is never quenched. The example above is an instance of a doublet in which the same Markan statement is used in two places by Matthew. Since the focus of attention is Matthew 5:30, the synoptic parallel in Luke 17:2 is not pertinent. The Markan pericope, or narrative section, concerning offenses (Mark 9:42-48, with vv. 44 and 46 being later additions to Mark derived from v. 48) is utilized by Matthew 18:6-9 (with the addition of a Matthean “woe” in v. 7), following the Markan order. Matthew here combines separate Markan statements about the hand and foot (Mark 9:43, 45) into a single statement (Matt. 18:8), but Matthew still retains the Markan order of hand, foot, and then eye. In the doublet of this material in Matthew 5:29-30 the statement of Mark 9:47 about the eye (with the addition of the Matthean adjective “right” to modify “eye”) is brought ahead in order to immediately follow Jesus’s teaching concerning the person who looks at a woman to lust after her. Then follows the statement from Mark 9:43 about the hand (again with the addition of the Matthean adjective “right”). Matthew omits reference to the foot (Mark 9:45), since it is unnecessary in this context. It is significant that the earliest text in the synoptic parallel of Mark 9:43 contains the infinitive apelthein, “to go away,” which is the same verb as the apelthe found in the earliest Greek text of Matthew (Gundry 1982, 89). Consequently, both internal considerations of what Matthew is most likely to have originally written and external attestation of manuscript witnesses support the reading “go into hell” at Matthew 5:30. Examples 3 and 4 illustrate how a text in one gospel is influenced by a parallel text in another gospel. Such textual harmonization may be either conscious or unconscious, since the early scribes knew the gospel texts by heart, and it is easy to understand how memorized scriptures could affect the text being written by hand. This occurs most often within the synoptic gospels. For with the judgment you make you will be judged, and the measure you give will be the measure you get. For with what judgment ye judge, ye shall be judged: and with what measure ye mete, it shall be measured to you again. It is significant that the earlier synoptic parallel in Mark 4:24 reads “the measure you give will be the measure you get.” The variant reading antimetrethesetai, “it will be measured … in return,” is also found at the parallel in Luke 6:38, which reads “for the measure you give will be the measure you get back” (NRSV). Since this Lucan text is very firm among the Greek witnesses to Luke 6:38 with only the original hand of the fourth-century Codex Vaticanus, the sixth-century Codex Guelfer-bytanus A, and a few minuscules harmonizing to metrethesetai, it seems more likely that scribes harmonized some Matthean texts to the Lucan form. In summary, the earliest and best manuscripts support the reading metrethesetai. The external and internal evidence is clear that the shorter reading in Matthew 7:2 is the more original. Welch (1990, 155) asserts that the variant readings were not “significant enough” to be included in the Greek New Testament published by the United Bible Societies (Aland 1983), but they were not chosen for inclusion in the limited number of variants cited in that edition because there is little question about the correct text. In Matthew 5:44 the shorter reading agapate tous echthrous humon kai proseuchesthe huper ton diokonton humas, “love your enemies and pray for those who persecute you,” is supported by the fourth-century Codex Sinaiticus, the fourth-century Codex Vaticanus, family 1, 22, 660, 1449, 1582, the fourth- or fifth-century Codex Bobiensis of the Old Latin, the fourth-century Sinaitic Syriac, the fifth-century Curetonian Syriac, the Sahidic, part of the Bohairic, Irenaeus, Origen (two out of three of his citations), and Cyprian (see Illustration 2). This is a diversified array of important witnesses, with the earliest extant texts in the Greek, the [p.142] Latin, the Syriac, and the Coptic as well as the second-century Irenaeus providing strong support for the shorter form of Matthew 5:44. Before listing the many textual variants among the manuscript witnesses of this passage, it is helpful to compare this earliest form of Matthew 5:44 with the synoptic parallel at Luke 6:27-28. The two Matthean clauses are numbered 1, 4a, and 4b, so that they can be compared and contrasted with the first and fourth Lucan clauses. The absence of any Matthean words to correspond with the second and third Lucan clauses does not imply a gap in Matthew. The Lucan form has a four-fold command composed of two synonymous parallelisms instead of the simpler, two-fold command in the earliest form of Matthew (Guelich 1982, 227-28). No witness of Luke 6:27-28 has the shorter form in Matthew 5:44. The four Lucan clauses are firm in the textual tradition. The earliest form of Matthew 5:44 (order 1-4a-4b) and the witnesses which support it have already been cited. Later witnesses of Matthew 5:44 harmonize and/or conflate this Matthean text with words and/or clauses from the Lucan parallel (Tasker 1964, 411; Sanders 1969, 263). Theophilus and Origen (one out of three citations) have in the second Matthean clause a substitution from the fourth Lucan clause (order 1-4a-4c). Part of the Bohairic and Athenagoras add the third clause from Luke and leave the second Matthean clause untouched (order 1-3-4a-4b). Three minuscules, a lectionary, and Clement of Alexandria add the third Lucan clause and have a conflation between the fourth Lucan clause and the last half of the second Matthean clause (order 1-3-4a-4c-4b). This combination and order coincide with Tatian’s Diatessaron, which at this point is not per se a quotation of Matthew 5:44, but is the result of his deliberate combination of this verse with parts of Luke 6:27-28, as cited by the fourth-century Syriac writer Aphraates. The American and British committees of the International Greek New Testament Project twice misrepresent the Diatessaric testimony of Aphraates at this point (American and British Committees 1984, 126-27; see Aphraates, [p.143] Demonstration 2.12, in Patrologia Syriaca 1 :73). In a combination found only in the Latin tradition, four Old Latin manuscripts and the Vulgate add the second Lucan clause and have a reverse order of conflation consisting of the second Matthean clause and then the last half of the fourth Lucan clause (order 1-2-4a-4b-4c). Two manuscripts of the Old Latin also add the second Lucan clause but have a conflation between the fourth Lucan clause and the last half of the second Matthean clause (order 1-2-4a-4c-4b). The vast majority of manuscripts add the third and then the second Lucan clauses and have a conflation between the fourth Lucan clause and the last half of the second Matthean clause (order 1-3-2-4a-4c-4b). This order is supported by the fifth-century Codex Bezae Cantabrigiensis, the fifth-century Codex Freerianus, eleven later uncials of the eighth to tenth centuries, family 13 and the majority of minuscules, the 1550 Textus Receptus, four Old Latin manuscripts, the Peshitta, the Harclean Syriac, the Palestinian Syriac lectionary, but no patristic writer before the fourth century. Two minuscules and a lectionary follow the majority text in having both the third and second clauses but drop the last part of the fourth clause due to homoeoteleuton (order 1-3-2-4a-4c). One minuscule adds the second clause and has a substitution in the fourth clause; probably a better way to describe the text of this minuscule is that it follows the majority text but drops the third Lucan clause and also drops the last part of the fourth clause due to homoeoteleuton (order 1-2-4a-4c). Welch argues that “the textual evidence is not as strong” in favor of the earliest text of Matthew 5:44 as it is in the other examples and gives as his first reason that “Bezae Cantabrigiensis (D) and many other early Greek texts have longer and different versions” of Matthew 5:44 (Welch 1990, 156). This misrepresents the age of the Greek witnesses, since the early manuscripts support the shorter reading of Matthew 5:44 and Codex Bezae Cantabrigiensis and Codex Freerianus, which date from the fifth century, with the rest of the uncials and minuscules being of the eighth century and later. In fairness to Welch, his earlier study does not use the inaccurate adjective “early,” which only appears in his 1990 version (Welch 1985, 11-12). Also Welch does not appear to be aware that having “longer and different versions” is a sure indication that the original text has been modified (Metzger 1971, 14; Aland and Aland 1989, 301). 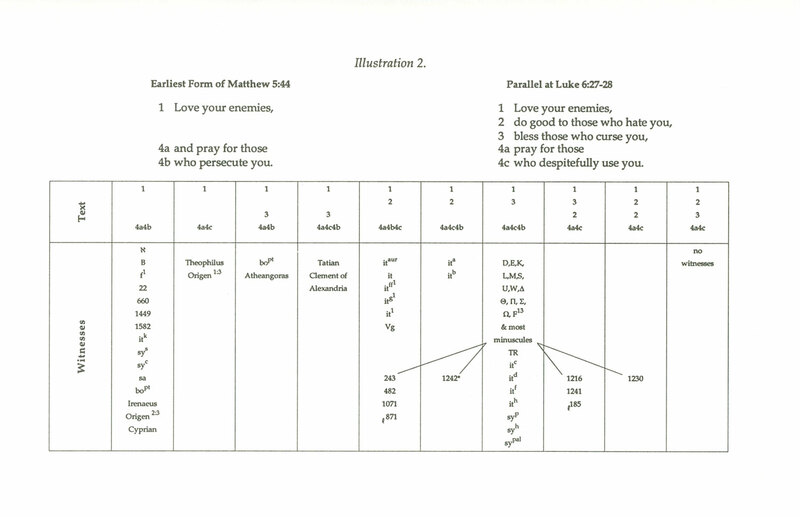 The many variant readings of Matthew 5:44 are not simply gratuitous additions but scribal efforts to harmonize the text by using known or remembered wording from Luke (Beare 1981, 160). The other argument Welch uses is that Codex Bezae Cantabrigiensis “agrees with the Sinaiticus and Vaticanus codices on most of these other points” but does not do so in Matthew 5:44 (Welch 1990, 156). However, one does not have a weaker case because Codex Bezae does [p.145] not join with the earliest witnesses. Metzger observes concerning Codex Bezae that “no known manuscript has so many and such remarkable variation from what is usually taken to be the normal New Testament text” (Metzger 1968, 50), and one of the most distinctive characteristics of Codex Bezae is a high degree of harmonization within the texts of the synoptic gospels (Vogels 1910). Since the point at issue in Matthew 5:44 is synoptic harmonization, one would expect Codex Bezae to have the harmonized reading based on the Lucan parallel. The Alands point out that when Codex Bezae “supports the early tradition the manuscript has a genuine significance, but it … should be examined most carefully when it opposes the early tradition” (Aland and Aland 1989, 110). In summary, the manuscript sources exhibit an array of textual variation in Matthew 5:44. However, the fact that not a single manuscript of Matthew has the text in the exact order of Luke (1-2-3-4) indicates that the earliest text of Matthew with the two-fold statement was not simply expanded in one operation. The evidence indicates that a series of partial scribal harmonizations occurred in which several textual forms arose. Both external manuscript evidence and internal considerations support the earliest text in Matthew 5:44. Examples 5-8 show how texts have been added to and amplified over time. so that your alms may be done in secret; and your Father who sees in secret will reward you. That thine alms may be in secret: and thy Father, which seeth in secret, himself shall reward thee openly. But whenever you pray, go into your room and shut the door and pray to your Father who is in secret; and your Father who sees in secret will reward you. But thou, when thou prayest, enter into thy closet, and when thou hast shut thy door, pray to thy Father which is in secret; and thy Father, which seeth in secret, shall reward thee openly. so that your fasting may be seen not by others but by your Father who is in secret; and your Father who sees in secret will reward you. That thou appear not unto men to fast, but unto thy Father which is in secret: and thy Father, which seeth in secret, shall reward thee openly. These three textual readings are related, but the particular [p.146] manuscript support for each varies. This presents the additional problem of deciding the possible influence of one variant on another. In Matthew 6:4, 6 the shorter reading “your Father … will reward you” is strongly supported by the fourth-century Codex Sinaiticus, the fourth-century Codex Vaticanus, the fifth-century Codex Bezae Cantabrigiensis, the sixth-century Codex Dublinensis, family 1, family 13 (in v. 4), 22, 33 (in v. 4), 544, 660, 1582 (in v. 4), six Old Latin manuscripts, the Vulgate, the fourth-century Sinaitic Syriac (in v. 6), the fifth-century Curetonian Syriac, one manuscript of the Palestinian Syriac lectionary (in v. 6), the Sahidic, the Bohairic, the Fayyumic, Origen, and Cyprian (in v. 4). At the end of vv. 4 and 6 the interpretive addition en to phanero, “in the open,” or as in the KJV “openly” is supported by fifteen uncials, family 13 (in v. 6) and the majority of minuscules, the 1550 Textus Receptus, eight Old Latin manuscripts, the fourth-century Sinaitic Syriac (in v. 4), the Peshitta, the Harclean Syriac, the Palestinian Syriac lectionary, but no patristic writer before the fourth century. In Matthew 6:18 the shorter reading “your Father … will reward you” is supported by the fourth-century Codex Sinaiticus, the fourth-century Codex Vaticanus, the fifth-century Codex Bezae Cantabrigiensis, fifteen other uncials, minuscule 1, family 13 and a majority of minuscules, the margin of the 1550 Textus Receptus, five Old Latin manuscripts, the Vulgate, the fifth-century Curetonian Syriac, the Peshitta, the Harclean Syriac, manuscripts of the Palestinian Syriac lectionary, the Sahidic, the Bohairic, and Theophilus. The presence of en to phanero, “in the open,” at the end of v. 18 is supported by only three uncials, a minority of minuscules, the 1550 Textus Receptus, six Old Latin manuscripts, and one manuscript of the Palestinian Syriac lectionary. Since the earliest Greek witness to support this addition dates from the eighth century, its presence in the verse should be attributed to assimilation to either v. 4 or v. 6, where the phrase was added to the text much earlier. It would be difficult to demonstrate whether v. 4 or v. 6 was the first to have the added phrase, since whichever one was first the phrase was soon added to the other. And do not bring us to the time of trial, but rescue us from the evil one. And lead us not into temptation, but deliver us from evil: for thine is the kingdom, and the power, and the glory, for ever. Amen. The absence of any doxology in Matthew 6:13 is supported by the fourth-century Codex Sinaiticus, the fourth-century Codex Vaticanus, the fifth-century Codex Bezae Cantabrigiensis, the sixth-century Codex Dublinensis, the fifth- or sixth-century 0170, family 1, 130, 372, 1582, lectionary 547, seven Old Latin manuscripts, the original text of Jerome’s Vulgate, the Syriac Acts of Thomas, part of the Bohairic, the Middle Egyptian, Tertullian, Origen, and Cyprian (see Illustration 3). The citation of the Vulgate is problematic due to variation among manuscripts and printed editions, but that the true reading of Jerome’s Vulgate lacks the added amen at the end of the Lord’s Prayer is supported by early Vulgate manuscripts and modern printed editions (Wordsworth and White 1889; White 1911; Weber 1984). The Sinaitic Syriac is not extant for Matthew 6:13, but F. Crawford Burkitt argues that the Syriac Acts of Thomas quotes the Lord’s Prayer in the Old Syriac version without any doxology (Burkitt 1904, 2:104-106; cf. Wright 1871, 1:313; 2:279; cf. Klijn 1962, 144, 293). Though it has been contested, Andrew Bandstra gives reasons why Tertullian’s De Oratione should be confidently cited for the absence of the doxology in Matthew (Bandstra 1982, 90-91; cf. Van Bruggert 1982, 83). This array of witnesses not supporting doxology in Matthew 6:13 produces a strong combination, since it includes representatives of the Proto-Alexandrian, the Later Alexandrian, the so-called Pre-Caesarean, the Western, the Eastern, and the early patristic commentaries on the Lord’s Prayer. Also the important ninth- or tenth-century minuscule 1424 and other scholia manuscripts have the following note to Matthew 6:13: “The [words] ‘for thine is the kingdom’ up to the ‘amen’ do not lie in some manuscripts.” Many minuscules indicate uncertainty about the right of the doxology to stand at the end of the Lord’s Prayer by transcribing it in red letters. The evidence is strong and broadly based that the doxology was not originally part of the text of Matthew (Filson 1960, 97; Bruce 1983, 81; Hendrickx 1984, 124). Even the conservative John F. MacArthur admits that the doxology was not in the original text (MacArthur 1985, 397). The familiar triple strophic doxology is found in the vast majority of manuscripts: hoti sou estin he basileia kai he dunamis kai he doxa eis tous aionas amen “For thine is the kingdom, and the power, and the glory, for ever. Amen.” This form is supported by sixteen uncials, family 13 and the majority of minuscules, the 1550 Textus Receptus, two Old Latin manuscripts, the Harclean Syriac, the Palestinian Syriac lectionary, part [p.150] of the Bohairic, but no patristic writer before the fourth century. The mere number of manuscripts supporting this variant reading is sometimes used as an argument in favor of the doxology, but manuscripts should be weighed not counted (Welch 1976, 17). Sidney B. Sperry and S. Brent Farley assume that the doxology is a part of the Lord’s Prayer and give no indication of being aware of its absence in the earliest and best New Testament manuscripts and the editions of the Greek New Testament (Sperry 1947, 136; Farley 1988, 158). J. Reuben Clark, Jr., counselor in the First Presidency of the LDS church, referred in a Latter-day Saint general conference address to the Matthean doxology as “those great sanctifying words” which modern scholarship had eliminated from the text; Clark declared that those who followed the earlier texts and removed the doxology were somehow “tampering with the Lord’s Prayer” (1954, 41; 1956, 353). The doxology was not absolutely fixed, for the correction to one minuscule, Codex Sangermanensis of the Old Latin, and the Peshitta follow this traditional form but lack the “amen.” A few minuscules expand “for ever” to “for ever and ever.” Also the liturgy ascribed to Chrysostom, two twelfth-century minuscules, and a fifteenth-century minuscule expand the traditional doxology into a trinitarian formula by adding “of the Father and of the Son and of the Holy Spirit” after the words “and the glory.” Due to homoeoteleuton this trinitarian formula is shortened in a fifteenth-century minuscule by the accidental omission of the words “and the power and the glory.” The doxology is clearly a secondary addition in Matthew (Brown 1965, 253; Gerhardsson 1984, 218). Joachim Jeremias indicates the prayer customs in first-century Judaism: “There were two ways of ending a prayer, a fixed conclusion and a conclusion formulated freely by the suppliant, called the hatima (‘seal’). Originally the Lord’s Prayer was a prayer with the ‘seal’, i.e., with a freely formulated conclusion” (Jeremias 1971, 203; cf. Jeremias 1967, 106). Quoting from Jeremias’s 1963 study, Hugh Nibley makes several other assertions concerning the doxology and the Lord’s Prayer: “The most significant example of this freedom of composition is certainly the Lord’s Prayer. ‘Originally,’ wrote Jeremias, ‘the doxology, For Thine is the kingdom, and the power, and the glory, for ever, was absent,’ yet it is found in the oldest Church order, the “Teaching of the Twelve Apostles” [the Didache]. Has someone taken liberties with the sacred canon, then? No, ‘the absence of the doxology from the original text, …’ Jeremias explains, ‘does not mean that Jesus intended his prayer to be recited without a word of praise at the end. But in the very earliest times, the doxology had no fixed form and its precise wording was left to those who prayed.’ Only ‘later on … it was felt necessary to establish the doxology in a fixed form,’ which explains why the prayer has different [p.151] forms in Matthew 6:13 and Luke 11:4″ (Nibley 1978, 51, emphasis in original). Nibley here misrepresents the unique doxological form in the “Teaching of the Twelve Apostles” (Didache), by equating it with the later, traditional doxology. Though Jeremias’s position is clear that the original text of Matthew 6:13 lacked the doxology, Jeremias asserts that early Christians recited the Lord’s Prayer with spontaneous words of praise as the ending, and in the early period there were prevalent various doxological formulae which varied according to the person offering the prayer. Thus the evidence indicates that Nibley’s rhetorical question about whether or not someone has taken “liberties with the sacred canon” of Matthew 6:13 should be answered with a firm “Yes.” Nibley does not disclose to readers that the second ellipsis in his quotation from Jeremias eliminates a crucial clause that ties the establishment of a fixed form of the doxology to a later time “when the Lord’s Prayer began to be used in the services of the Church as a common prayer” (Jeremias 1963, 10; cf. Jeremias 1967, 106-107). Nibley then asserts that the establishment of a fixed form for the doxology “explains why the prayer has different forms in Matthew 6:13 and Luke 11:4.” However, it explains no such thing, for the evidence indicates that both gospels lacked the doxology in their earliest state and that in Matthew it was added in various forms. Nibley denies that New Testament manuscripts show a growth of doxological forms and asserts that such a development of the doxology is clear “only if you arrange the manuscripts yourself to do that. That’s what they [the scholars] do. You can’t date them except by typology. Then you put their types exactly in the order you want to put them—then you get the clear development. That’s the way it happens. …” (Nibley 1990, 51). Paleographers and papyrologists would contest Nibley’s position, since they are confident that manuscripts can be dated not by internal typology but by analysis of handwriting style to the century or adjacent centuries in which they were created. Welch says that the absence or presence of the doxology in Matthew 6:13 is “unsettled among biblical scholars,” but actually there is a strong consensus against the Matthean doxology (Welch 1990, 157). The doxology seems to have originated as the Lord’s Prayer was adapted to early Christian liturgical use, perhaps under the influence of 1 Chronicles 29:11-13 and 2 Timothy 4:18 (Allen 1912, 60; Tasker 1964, 412). In known Eastern liturgies the congregation recites the Lord’s Prayer with the priest giving the doxology, so it has been suggested that in the early Christian liturgies “the doxology was left for the leader to formulate” (Davies and Allison 1988, 615). Scribes, knowing that a doxology “was the customary way to end a prayer,” would naturally add some form of it to their manuscripts (Albright and Mann 1971, 77). Since [p.154] the Lord’s Prayer ends with a plea for deliverance from evil or the evil one, the doxology may have been added for rhetorical as well as liturgical reasons (Vaught 1986, 133). On the other hand, it is unlikely that a copyist would have intentionally omitted the doxology (Newman and Stine 1988, 178). To understand the growth of the doxology in Matthew 6:13, one must understand how the text of the Lord’s Prayer developed in the respective gospels of Matthew and Luke. There are several significant differences between the Matthean and Lucan versions of the Lord’s Prayer. The earliest form of Luke 11:2-4, which is supported by the third-century papyrus 75, is compared to the Lord’s Prayer as found in KJV Matthew 6:9-13. Give us each dayour daily bread. indebted to us. Give us this dayour daily bread. Notice that Luke has only “Father” instead of the Matthean “our Father which art in heaven,” which has been described as “a very considerable modification” of the Aramaic abba, “father” (Perrin 1976, 41). Also Luke lacks “thy will be done in earth, as it is in heaven”; has the present imperative verb form “give [and keep giving]” instead of the Matthean aorist imperative, implying a single act of giving; has “each day” instead of “this day”; has “our sins” instead of “our debts”; has “everyone indebted to us” instead of “our debtors”; lacks the Matthean antithesis “but deliver us from evil” after “do not bring us to the time of trial”; and lastly and most importantly, Luke lacks any doxology. It is certainly significant that at the points where Luke lacks Matthean material, the form [p.155] in Luke is completely contained in the longer form of Matthew (Strecker 1988, 107). This leads to the conclusion that Matthew’s text is an early expansion of the shorter form found in Luke, for “in the early period, before wordings were fixed, liturgical texts were elaborated, expanded, and enriched.” Further confirmation of Matthew’s expanding the original form is the fact that the instances of expansion are “found toward the end of a section of the prayer—he first at the end of the address, the second at the end of the ‘thou-petitions’, the third at the end of the ‘We-petitions'” (Jeremias 1967, 90). These are typical of liturgical expansions. However, the variations in the textual tradition of the Matthean and Lucan forms of the Lord’s Prayer make it difficult to be certain of the original words spoken by Jesus (Betz 1985, 66). Faced with early Greek, Latin, Syriac, Coptic, and patristic texts without a doxology and later manuscripts with various kinds of doxologies, Welch argues that the doxology was originally present in Matthew 6:13 but that the early Greek manuscripts “may have been changed to conform with” Lucan manuscripts (Welch 1990, 158). But there is no manuscript of Matthew which ever omits words in order to agree with the Lucan parallel. Welch’s theoretical possibility is totally without foundation. The process is clearly in the direction of fuller, more complete doxological forms. Various manuscripts of Luke have been assimilated to the fuller, more familiar form found in Matthew (Metzger 1968, 197). This process of harmonization is so thorough that at each and every point—except one—where the earliest Greek text of Luke 11:2-4 differs from the Textus Receptus of Matthew 6:9-13, there are at least some manuscripts of Luke which have been harmonized to the more familiar Matthean form (Kenyon 1975, 210). That single exception is the Matthean doxology, for the most exhaustive Greek New Testament critical apparatus ever published does not show any Greek manuscript, ancient version, or patristic writer which has assimilated Luke 11:4 to the doxology of Matthew 6:13 (American and British Committees 1984, 1:245; Greenlee 1985, 86). This is compelling evidence that in the early Christian period, when such harmonizations between the synoptic gospels were made, the doxology of Matthew 6:13 had not yet been added to texts of Matthew. The doxology was added to New Testament manuscripts at a later period, and the reason it was not added to Luke but was added to Matthew is “because being the fuller it [Matthew] was preferred for liturgical purposes” (McNeile 1915, 82). It is instructive to see how narrowly the doxology of Matthew 6:13 entered into the Textus Receptus. To do this properly one must go back earlier than the first published text to the first Greek New Testament prepared for publication—the Complutensian Polyglot (Ximénez 1514; see Illustration 4). In this earliest printed text the doxology was not [p.156] included and Demetrius Ducas’s marginal note explains that the doxology crept into Greek manuscripts by way of the Greek mass where only the priest uttered it (Bentley 1980, 148; 1983, 96). Independent of the Complutensian Polyglot, Erasmus also concluded that the doxology was a late addition to the text. However, Erasmus prints it in his text because it occurred in minuscule 2, which was the printer’s manuscript for the 1516 edition. In his extensive Annotationes appended to the 1516 edition, Erasmus argues against the authenticity of the doxology, pointing out that it is absent in the Vulgate and was added to the Lord’s Prayer for the same reason that the phrase gloria patri was added at the end of various Psalms (Erasmus 1516, 11, 250; cf. Erasmus 1986, 35-36). It is ironic that although Erasmus had minuscule 1 at hand, he did not study this valuable manuscript more carefully, for there is probably not a single minuscule with a better text of the gospels than minuscule 1. Erasmus considered it to be a beautiful and elegant manuscript but not an accurate text (Rummel 1986, 36-37). It lacks the doxology and would have provided the needed Greek confirmation for his own conclusion about the secondary nature of the doxology in Matthew 6:13. The modern scholastic practice would place a secondary text in a footnote. 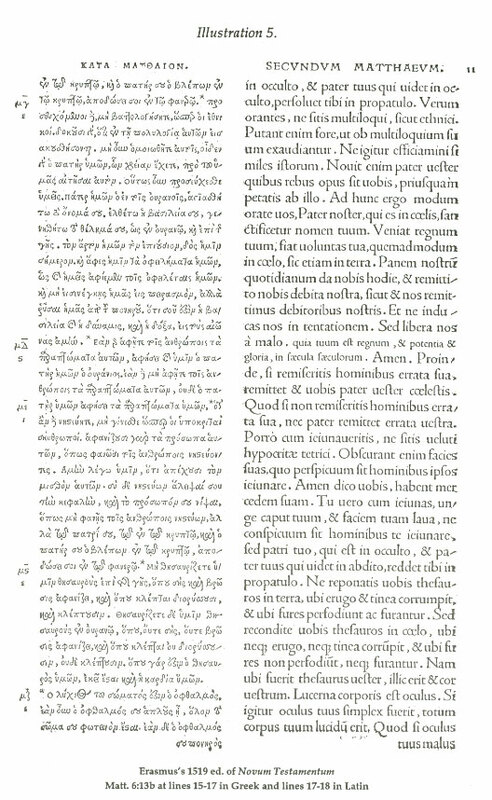 In his 1519 and succeeding editions, Erasmus hit on the novel idea of using smaller type in his Latin translation in the adjacent column in order to indicate that the doxology was not original (see Illustration 5). This distinction by Erasmus was lost as later editors just reprinted his Greek text without incorporating any difference in typeface. In this precarious way the doxology found its way into the Textus Receptus, and eventually into the KJV. 1. The present study is based on my “The Sermon on the Mount: What Its Textual Transformation Discloses Concerning the Historicity of the Book of Mormon,” Trinity Journal 7 (Spring 1986): 23-45. This earlier article was reviewed prior to publication by John W. Welch, “Notes on the Greek Text of the Sermon on the Mount in Reference to 3 Nephi 12-14,” 1985, unpublished; and after publication by Welch, The Sermon at the Temple and the Sermon on the Mount, 1990, 145-63. 2. These various editions are: Constantinus Tischendorf, Novurn Testamentum Graece, 8th ed., 2 vols. (Leipzig: Giesecke & Devrient, 1869-72); B. F. Westcott and F. J. A. Hort, The New Testament in the Original Greek, 2 vols. (Cambridge and London: Macmillan and Co., 1881); Hermann von Soden, Die Schriften des Neuen Testaments (Göttingen: Vandenhoeck und Ruprecht, 1913); [The British and Foreign Bible Society,] H KAINH IAHKH, 2d ed., [edited by G. D. Kilpatrick] (London: The British and Foreign Bible Society, 1958); G. D. Kilpatrick, Matthew: A Greek-English Diglot (London: The British and Foreign Bible Society, 1959); Eberhard Nestle, Erwin Nestle, and Kurt Aland, Novurn Testamenturn Graece, 25th ed. (Stuttgart: Württembergische Bibelanstalt, 1963); R. V. G. Tasker, The Greek New Testament: Being the Text Translated in the New English Bible, 1961 (Oxford: Oxford University Press and Cambridge University Press, 1964); Augustinus Merk, Novurn Testamenturn Graece et Latine, 9th ed. (Rome: Pontifical Biblical Institute, 1964); José M. Bover and José O’Callaghan, Nuevo Testamento Trilingüe (Madrid: Biblioteca de Autores Cristianos, 1977); Kurt Aland and Barbara Aland, Nestle-Aland Novurn Testamenturn Graece, 26th ed. (Stuttgart: Deutsche Bibelstiftung, 1979). This twenty-sixth edition differs from the twenty-fifth edition (Nestle, Nestle, and Aland 1963) in at least 925 places. The twenty-sixth edition is the same text as found in two other publications: Kurt Aland, Synopsis Quattuor Evangeliorum, 13th ed. (Stuttgart: Deutsche Bibelgesellschaft, 1985), and Kurt Aland et al., The Greek New Testament, 3d ed. cor. (New York: United Bible Societies, 1983). 3. While the point of comparison is the Book of Mormon, the question arises as to how these passages are handled in the version known as the Joseph Smith Revision (JSR) of the KJV. The JSR, sometimes referred to as the Inspired Version or the Joseph Smith Translation, has not been substantiated by modern manuscript discovery as an “inspired textual restoration” of the original wording of the New Testament (Barney 1986, 100). Robert Millet, BYU professor of religion, admits that it is difficult to know when a revision by Smith “represents a restoration of lost textual material or events or when it represents inspired prophetic commentary” (Millet 1985, 84). The Sermon on the Mount portion of the JSR was dictated between 8 March and 4 April 1831. In each of the eight selected examples from the Sermon on the Mount, the JSR does not agree with the original text. In six instances it simply copies the KJV and the Book of Mormon. At the two other instances the text of the JSR either conflates the differing KJV and Book of Mormon texts (see n5) or revises the KJV (see n6). 4. Remember, the KJV was not a fresh translation from Greek into English but a revision “with the former translations diligently compared and revised,” using as the main text the 1572 second folio edition of the Bishops’ Bible (Hammond 1982, 144). In this case the Bishops’ Bible had the preposition “vnto” which the KJV incorrectly changed to “by” and relegated the preposition “to” to the margin. The rendition of the Bishops’ Bible goes back to William Tyndale’s “vnto them off thee olde tyme” in 1526. 5. It is useful to examine how this passage is handled in the JSR. First, in New Testament manuscript 1 of the JSR, in the handwriting of Sidney Rigdon, the text of 3 Nephi 12:29-30 is quoted and then Matthew 5:29 is quoted from the 1828 Phinney edition of the KJV. In the original transcript of the manuscript, there is an omission of Matthew 5:30 at a point where Matthew 5:29-30 share exactly the same twenty-nine words. Probably what happened was that Matthew 5:30 was accidentally skipped due to homoeoteleuton, just like the error in Codex Bezae and the Sinaitic Syriac (see Example 2 in the Technical Appendix). However, this omission was later noticed and a slip of paper was pinned to the manuscript with the missing text of Matthew 5:30 as well as the following reflection on the figurative nature of the passage: “And now this I speak, a parable concerning your sins; wherefore, cast them from you, that ye may not be hewn down and cast into the fire.” This conflation of three different sources was copied by John Whitmer into New Testament manuscript 2 of the JSR and into the published Inspired Version of 1867. Neither the Book of Mormon revision nor the wording unique to the JSR is supported by ancient sources. 6. The JSR alters the text of the KJV and the Book of Mormon in a direction further away from the original text, for in the doxology of Matthew 6:13 this text expands the KJV “for ever” to “forever and forever” (New Testament manuscript 1, JSR). This was copied by John Whitmer as “forever & ever” (New Testament manuscript 2, JSR) and published in the Inspired Version of 1867. Also while revising the gospel of Luke, Joseph Smith took the words “for thine is the kingdom and the power. Amen” from part of this traditional Matthean doxology in the KJV and added them to the end of Luke 11:4. This shortened form is not found as a variant reading in either Matthew 6:13 or Luke 11:4. The JSR may here be typical of how doxologies tend to grow onto various texts, but it is certainly not the original text of Luke 11:4. After mentioning the scholarly support for omitting “without a cause” in Matthew 5:22 and the lack of that support in including the doxology in Matthew 6:13, Robert A. Cloward can only say: “Those who are inclined to disparage or vindicate the JST by comparing individual changes with modern biblical criticism concentrate on trees and miss the forest” (1985, 200). 7. The close connection of the text of the Book of Mormon to the KJV is further illustrated by the fact that P in 3 Nephi 12:36 has “thy head,” which is the text of the KJV in Matthew 5:36, even though this reading was not printed in the Book of Mormon until the 1981 edition. On the other hand it cannot be argued that the phrase “on earth” in the Lord’s Prayer in 3 Nephi 13:10 better translates the Greek, since the original Book of Mormon text, found in P and all the early editions, is “in earth” just as in the KJV in Matthew 6:10. Another factor to consider [in assessing the need to apply conjectural emendation to the Book of Mormon text] is the biblical quotations within the Book of Mormon, since Sidney B. Sperry admits that Joseph Smith “may have used the King James Version” and then made revisions when the text on the plates warranted it (Book of Mormon Compendium, 507). The fact that about half of the Isaiah verses that are quoted in the Book of Mormon are exactly the same as the KJV, and that many of the others are the same except at the very point where the KJV has italics, and finally that the Original Manuscript of 1 Nephi 20:11 shows the KJV text before being changed into the Book of Mormon revision, all tend to make this admission of possible use into a certainty. Since the English Bible may at any point be unintentionally misread, this is another possible source of error and is quite possibly the explanation for the omissions of biblical text involved in the passages in 2 Nephi 8:15 and 2 Nephi 23:8. These words evidently stated too clearly that Joseph Smith plagiarized from the KJV when dictating the biblical quotations in the Book of Mormon. 8. The third person plural verbs “they light” in Matthew 5:15 (3 Ne. 12:15) and “they gather” in Matthew 7:16 (3 Nephi 14:16) are used without an explicit subject and are better expressed in English as the impersonal “one lights” and “one gathers” (Turner 1963, 292-93). Aland, Kurt. Kurzgefasste Liste der griechischen Handschriften des Neuen Testaments. Berlin: Walter de Gruyter, 1963. ______. Synopsis Quattuor Evangeliorum. 13th ed. Stuttgart: Deutsche Bibelgesellschaft, 1985. Aland, Kurt, and Barbara Aland. Nestle-Aland Novurn Testamentum Graece. 26th ed. Stuttgart: Deutsche Bibelstiftung, 1979. ______. The Text of the New Testament: An Introduction to the Critical Editions and to the Theory and Practice of Modern Textual Criticism. Translated by Erroll F. Rhodes. 2d ed. rev. and enl. Grand Rapids, MI: Eerdmans Publishing Company; Leiden: E. J. Brill, 1989. Aland, Kurt, et al. The Greek New Testament. 3d ed. cor. New York: United Bible Societies, 1983. Albright, W. F., and C. S. Mann. Matthew, Introduction, Translation, and Notes. [p.157] (Anchor Bible.) Garden City, NY: Doubleday and Company 1971. Allen, Willoughby C. A Critical and Exegetical Commentary on the Gospel According to S. Matthew, 3d ed. Edinburgh: T. and T. Clark Limited, 1912. The American and British Committees of the International Greek New Testament Project. The New Testament in Greek: The Gospel According to St. Luke. 2 vols. Oxford: Clarendon Press, 1984-87. Ashment, Edward H. “The Book of Mormon—A Literal Translation?” Sunstone 5 (Mar.-Apr. 1980): 10-14. Bandstra, Andrew J. “The Original Form of the Lord’s Prayer.” Calvin Theological Journal 16 (Apr. 1981): 15-37. ______. “The Lord’s Prayer and Textual Criticism: A Response.” Calvin Theological Journal 17 (Apr. 1982): 88-97. Barney, Kevin L. “The Joseph Smith Translation and Ancient Texts of the Bible.” Dialogue: A Journal of Mormon Thought 19 (Fall 1986): 85-102. Beare, Francis W. The Gospel According to Matthew: Translation, Introduction, and Commentary. San Francisco: Harper and Row Publishers, 1981. Bentley, Jerry H. “New Light on the Editing of the Complutensian New Testament.” Bibliothéque d’humanisme et renaissance 42 (1980): 145-56. ______. Humanists and Holy Writ: New Testament Scholarship in the Renaissance. Princeton, NJ: Princeton University Press, 1983. Betz, Hans Dieter. Essays on the Sermon on the Mount. Translated by L. L. Welborn. Philadelphia: Fortress Press, 1985. Black, David Alan. “Jesus on Anger: The Text of Matthew 5:22a Revisited.” Novum Testamentum 30 (1988): 1-8. Bover, José M., and José O’Callaghan. Nuevo Testamento Trilingüe. Madrid: Biblioteca de Autores Cristianos, 1977. [The British and Foreign Bible Society.] H KAINH IAHKH, 2d ed. [Edited by G. D. Kilpatrick]. London: The British and Foreign Bible Society, 1958. Brown, Raymond E. New Testament Essays. Milwaukee: Bruce Publishing Company, 1965. Bruce, F. F. The Hard Sayings of Jesus. (The Jesus Library.) London: Hodder and Stoughton, 1983. Burkitt, F. Crawford. Evangelion da-Mepharreshe: The Curetonian Version of the Four Gospels. 2 vols. Cambridge, Eng. : Cambridge University Press, 1904. Clark, J. Reuben, Jr. In One Hundred and Twenty-fourth Annual Conference of the Church of Jesus Christ of Latter-day Saints … April 3, 4, 5, and 6, 1954, 37-47. Salt Lake City: Church of Jesus Christ of Latter-day Saints, 1954. ______. Why the King James Version. Salt Lake City: Deseret Book, 1956. [p.158] Clark, Kenneth W. The Gentile Bias and Other Essays. Selected by John L. Sharpe III. (Supplements to Novum Testamentum 54.) Leiden: E. J. Brill, 1980. Clarke, Adam. The New Testament of Our Lord and Saviour, Jesus Christ: The Text Carefully Printed from the Most Correct Copies of the Present Authorised Version including the Marginal Readings and Parallel Texts with a Commentary and Critical Notes Designed as a Help to a Better Understanding of the Sacred Writings. New York: Abraham Paul, 1825. Cloward, Robert A. “The Sermon on the Mount in the JST and the Book of Mormon.” In The Joseph Smith Translation: The Restoration of Plain and Precious Things, 163-200. Edited by Monte S. Nyman and Robert L. Millet. Provo, UT: Religious Studies Center, Brigham Young University, 1985. Davies, W. D., and Dale C. Allison. A Critical and Exegetical Commentary on the Gospel according to Saint Matthew: Volume I, Introduction and Commentary on Matthew I-VII. Edinburgh: T. and T. Clark Limited, 1988. Elliott, J. K. A Survey of Manuscripts Used in Editions of the Greek New Testament. (Supplements to Novum Testamentum 57.) Leiden: E. J. Brill, 1987. ______. A Bibliography of Greek New Testament Manuscripts. Cambridge, Eng. : Cambridge University Press, 1989. Erasmus, Desiderius. Novum Instrumentum omne. Basel: John Froben, 1516. ______. Erasmus’s Annotations on the New Testament, The Gospels: Facsimile of the final Latin text (1535) with all earlier variants (1516, 1519, 1522, and 1527). Edited by Anne Reeve. London: Duckworth, 1986. Farley, S. Brent. “The Appearance of Christ to the People of Nephi (3 Nephi 11-14).” In Studies in Scripture: Volume 8, Alma 30 to Moroni, 149-60. Edited by Kent P. Jackson. Salt Lake City: Deseret Book, 1988. Farmer, William R. The Synoptic Problem: A Critical Analysis. 2d ed. Dillsboro: Western North Carolina Press, 1976. Filson, Floyd V. A Commentary on the Gospel according to St. Matthew. London: Adam and Charles Black, 1960. Finegan, Jack. Encountering New Testament Manuscripts: A Working Introduction to Textual Criticism. Grand Rapids, MI: Eerdmans Publishing Company, 1974. Gerhardsson, Birger. “The Matthaean Version of the Lord’s Prayer (Matt 6:9b-13): Some Observations.” In The New Testament Age: Essays in Honor of Bo Reicke, 1:207-20. Edited by William C. Weinrich. Macon, GA: Mercer University Press, 1984. Greenlee, J. Harold. Scribes, Scrolls, and Scripture: A Student’s Guide to New Testament Textual Criticism. Grand Rapids, MI: Eerdmans Publishing Company, 1985. Guelich, Robert A. The Sermon on the Mount: A Foundation for Understanding. Waco, TX: Word Books, 1982. [p.159] Gundry, Robert H. Matthew: A Commentary on His Literary and Theological Art. Grand Rapids, MI: Eerdmans Publishing Company, 1982. Hammond, Gerald. The Making of the English Bible. Manchester, Eng. : Carcanet New Press, 1982. Hendrickx, Herman. The Sermon on the Mount. (Studies in the Synoptic Gospels.) London: Geoffrey Chapman, 1984. Hodges, Zane C., and Arthur L. Farstad. The Greek New Testament According to the Majority Text. Nashville: Thomas Nelson Publishers, 1982. The Holy Bible Containing the Old and New Testaments: New Revised Standard Version. New York: Oxford University Press, 1989. The Holy Bible, Containing the Old and New Testaments: Together with the Apocrypha: Translated out of the Original Tongues, and with the Former Translations Diligently Compared and Revised. Cooperstown, NY: H. and E. Phinney, 1828. Jeremias, Joachim. “The Lord’s Prayer in Modern Research.” Christian News from Israel 14 (Apr. 1963): 10-13. ______. The Prayers of Jesus. London: SCM Press Ltd., 1967. ______. New Testament Theology: The Proclamation of Jesus. New York: Charles Scribner’s Sons, 1971. Kee, Howard Clark. “Synoptic Studies.” In The New Testament and Its Modern Interpreters, 245-69. Edited by Eldon Jay Epp and George W. MacRae. Philadelphia: Fortress Press; Atlanta: Scholars Press, 1989. Kenyon, F. G. The Text of the Greek Bible. Revised by A. W. Adams. 3d ed. rev. London: Duckworth, 1975. Kilpatrick, G. D. Matthew: A Greek-English Diglot. London: The British and Foreign Bible Society, 1959. Klijn, A. F. J. The Acts of Thomas: Introduction, Text, Commentary. (Supplements to Novum Testamentum 5.) Leiden: E. J. Brill, 1962. Knopf, Rudolf. “Eine Thonscherbe mit dem Texte des Vaterunser.” Mittheilungen des Kaiserlich Deutschen Archaeologischen Instituts, Athenische Abtheilung 25 (1900): 315-23. Lake, Kirsopp. Codex 1 of the Gospels and Its Allies. (Texts and Studies 7.) Cambridge, Eng. : Cambridge University Press, 1902. Larson, Stan. “Textual Variants in Book of Mormon Manuscripts.” Dialogue: A Journal of Mormon Thought 10 (Autumn 1977): 8-30. ______. “Conjectural Emendation and the Text of the Book of Mormon.” Brigham Young University Studies 18 (Summer 1978): 563-69. ______. “The Sermon on the Mount: What Its Textual Transformation Discloses Concerning the Historicity of the Book of Mormon.” Trinity Journal [p.160] 7 (Spring 1986): 23-45. Legg, S. C. E. Novum Testamentum Graece secundum Textum Westcotto-Hortianum: Evangelium secundum Matthaeum. Oxford: Clarendon Press, 1940. Luz, Ulrich. Matthew 1-7: A Commentary. Translated by Wilhelm C. Linss. Edinburgh: T. and T. Clark Limited, 1990. MacArthur, John F. The MacArthur New Testament Commentary: Matthew 1-7. Chicago: Moody Press, 1985. Matthews, Robert J. “A Plainer Translation”: Joseph Smith’s Translation of the Bible, a History and Commentary. Provo, UT: Brigham Young University Press, 1975. McConkie, Bruce R. Doctrinal New Testament Commentary: Volume I, The Gospels. Salt Lake City: Bookcraft, 1965. McNeile, Alan H. The Gospel According to St. Matthew: The Greek Text with Introduction, Notes, and Indices. London: Macmillan and Company, 1915. Merk, Augustinus. Novum Testamentum Graece et Latine, 9th ed. Rome: Pontifical Biblical Institute, 1964. Metzget, Bruce M. The Text of the New Testament: Its Transmission, Corruption, and Restoration, 2d ed. Oxford: Clarendon Press, 1968. ______. A Textual Commentary on the Greek New Testament. London: United Bible Societies, 1971. ______. The Early Versions of the New Testament: Their Origin, Transmission, and Limitations. Oxford: Clarendon Press, 1977. Millet, Robert L. “Joseph Smith and the Gospel of Matthew.” Brigham Young University Studies 25 (Summer 1985): 67-84. Milligan, George. Selections from the Greek Papyri. 2d ed. Cambridge, Eng. : Cambridge University Press, 1912. Moulton, James H., and Wilbert F. Howard. A Grammar of New Testament Greek: Accidence and Word Formation. Vol. 2. Edinburgh: T. and T. Clark Limited, 1929. Nestle, Eberhard, Erwin Nestle, and Kurt Aland. Novum Testamentum Graece. 25th ed. Stuttgart: Württembergische Bibelanstalt, 1963. Newman, Barclay M., and Philip C. Stine. A Translator’s Handbook on the Gospel of Matthew. (Helps for Translators.) London: United Bible Societies, 1988. Nibley, Hugh. “New Approaches to Book of Mormon Study: Part I, Some Standard Tests.” The Improvement Era 56 (Nov. 1953): 830-31, 859-62. Reprinted in The Prophetic Book of Mormon, 54-60. Edited by John W. Welch. (The Collected Works of Hugh Nibley: Volume 8, the Book of Mormon.) Salt Lake City: Deseret Book and FARMS, 1989. [p.161] ______. “Literary Style Used in Book of Mormon Insured Accurate Translation.” Church News, Deseret News, 29 July 1961. Reprinted in The Prophetic Book of Mormon, 212-18. Edited by John W. Welch. (The Collected Works of Hugh Nibley: Volume 8, the Book of Mormon) Salt Lake City: Deseret Book and FARMS, 1989. ______. Since Cumorah: The Book of Mormon in the Modern World. Salt Lake City: Deseret Book, 1967. Reprinted in The Collected Works of Hugh Nibley: Volume 7, the Book of Mormon.) Edited by John W. Welch. Salt Lake City: Deseret Book and FARMS, 1988. ______. “The Early Christian Prayer Circle.” Brigham Young University Studies 19 (Fall 1978): 41-78. Reprinted in Mormonism and Early Christianity, 45-99. (The Collected Works of Hugh Nibley: Volume 4.) Salt Lake City: Deseret Book and FARMS, 1987. ______. Interview by Stan Larson, 19 Apr. 1990. Interview transcript, Everett L. Cooley Oral History Project, Special Collections, Marriott Library, University of Utah, Salt Lake City. Ostler, Blake T. “The Book of Mormon as a Modern Expansion of an Ancient Source.” Dialogue: A Journal of Mormon Thought 20 (Spring 1987): 66-123. Perrin, Norman. Rediscovering the Teachings of Jesus. New York: Harper and Row Publishers, 1976. Petersen, Mark E. Those Gold Plates! Salt Lake City: Bookcraft, 1979. Roberts, B. H. “Bible Quotations in the Book of Mormon; and Reasonableness of Nephi’s Prophecies.” Improvement Era 7 (Jan. 1904): 179-96. Roberts, Colin H. “An Early Papyrus of the First Gospel.” Harvard Theological Review 46 (1953): 233-37. Robertson, A. T. A Grammar of the Greek New Testament in the Light of Historical Research. Nashville: Broadman, 1934. Roca-Puig, Ramon. Un papir grec de l’evangeli de Sant Mateu. Barcelona: [Grafos, S.A.,] 1956. ______. Un papiro griego del evangelio de San Mateo, 2d ed. Barcelona: [Grafos, S.A.,] 1962. Rummel, Erika. Erasmus’s Annotations on the New Testament: From Philologist to Theologian. Toronto: University of Toronto Press, 1986. Russell, William D. “A Further Inquiry into the Historicity of the Book of Mormon.” Sunstone 7 (Sept.-Oct. 1982): 20-27. Sanders, E. P. The Tendencies of the Synoptic Tradition. Cambridge, Eng. : Cambridge University Press, 1969. Scrivener, Frederick H. Bezae Codex Cantabrigiensis. Cambridge, Eng. : Cambridge University Press, 1864. Skousen, Royal. “Towards a Critical Edition of the Book of Mormon.” Brigham [p.162] Young University Studies 30 (Winter 1990): 41-69. Smith, Joseph, Jr. The Book of Mormon: An Account Written by the Hand of Mormon, upon Plates Taken from the Plates of Nephi. Palmyra, NY: E. B. Grandin, 1830. Sperry, Sidney B. Our Book of Mormon. Salt Lake City: Stevens and Wallis, Inc., 1947. ______. Answers to Book of Mormon Questions: (Formerly Problems of the Book of Mormon). Salt Lake City: Bookcraft, 1967. ______. Book of Mormon Compendium. Salt Lake City: Bookcraft, 1968. Stendahl, Krister. “The Sermon on the Mount and Third Nephi.” In Reflections on Mormonism: Judaeo-Christian Parallels, 139-54. Edited by Truman G. Madsen. Provo, UT: Religious Studies Center, Brigham Young University, 1978. ______. Meanings: The Bible as Document and as Guide. Philadelphia: Fortress Press, 1984. Stephanus [Estienne], Robertus. THE KAINHE IAOHKH AIIANTA … Novurn Iesv Christi D. N. Testamenturn. Paris, 1550. Strecker, Georg. The Sermon on the Mount: An Exegetical Commentary. Translated by O. C. Dean, Jr. Nashville: Abingdon Press, 1988. ______. Tasker, R. V. G. The Greek New Testament: Being the Text Translated in the New English Bible, 1961. Oxford: Oxford University Press and Cambridge University Press, 1964. Taylor, Vincent. The Text of the New Testament: A Short Introduction. London: MacMillan Publishing Company Ltd., 1961. Tischendorf, Constantinus. Novum Testamentum Graece. 8th ed., 2 vols. Leipzig: Giesecke and Devrient, 1869-72. Tuckett, C. M. The Revival of the Griesbach Hypothesis: An Analysis and Appraisal. (Society for New Testament Studies Monograph Series 44.) Cambridge, Eng. : Cambridge University Press, 1983. Turner, Nigel. A Grammar of New Testament Greek: Syntax. Edinburgh: T. and T. Clark Limited, 1963. Van Bruggen, Jacob. “The Lord’s Prayer and Textual Criticism.” Calvin Theological Journal 17 (Apr. 1982): 78-87. Vaught, Carl G. The Sermon on the Mount: A Theological Interpretation. Albany: State University of New York Press, 1986. Vogels, Heinrich J. Die Harmonistik im Evangelientext des Codex Cantabrigiensis. (Texte und Untersuchungen 36.) Leipzig, 1910.
von Dobschütz, Ernst. “The Lord’s Prayer.” Harvard Theological Review 7 (July 1914): 293-321.
von Soden, Hermann. Die Schrifien des Neuen Testaments. Göttingen: Vandenhoeck und Ruprecht, 1913. [p.163] Weber, Robert. Biblia Sacra iuxta Vulgatam versionem, 3d ed. Stuttgart: Deutsche Bibelgesellschaft, 1984. Welch, John W. “The Lord’s Prayers.” Ensign 6 (Jan. 1976): 14-17. ______. “A Book You Can Respect.” Ensign 7 (Sept. 1977): 44-48. ______. “Notes on the Greek Text of the Sermon on the Mount in Reference to 3 Nephi 12-14.” Privately circulated, 30 Sept. 1985, David J. Buerger Collection, Special Collections, Marriott Library, University of Utah, Salt Lake City. ______. The Sermon at the Temple and the Sermon on the Mount: A Latter-day Saint Approach. Salt Lake City: Deseret Book and FARMS, 1990. Westcott, B. F., and F. J. A. Hort. The New Testament in the Original Greek. 2 vols. Cambridge, Eng. : Macmillan Publishing Company, 1881. White, Henry J. Novum Testamentum Latine Secundum Editionem Sancti Hieronymi. Oxford: Clarendon Press, 1911. Wordsworth, John, and Henry J. White. Novum Testamentum Domini Nostri Jesu Christi latine secundum editionem Sancti Hieronymi. 3 vols. Oxford: Clarendon Press, 1889-1954. Wright, William. Apocryphal Acts of the Apostles. 2 vols. London: Williams and Norgate, 1871.